We are currently designing a feature we are calling Remote Release Promotions. Spaces & Octopus Data Center Manager: Another new feature we are working on which complements Remote Release Promotions. We are planning a feature which enables you to promote releases across multiple Octopus Servers... in a nice way 😃 If you are doing this today, then you know that it's currently possible... but not exactly pleasant. For security purposes many organizations separate their production and development environments. For example, this is a common way to achieve PCI DSS compliance. The secure network may even be completely disconnected (aka air-gap). These organizations still want all of the Octopus-goodness, like promoting the same release through the environments, overall orchestration, and seeing the progression on the dashboard. But they don't want the development Octopus Server to be connected to the production environment. It's also common to want a different set of users (possibly from a distinct Active Directory domain) to have permissions to the production Octopus Server. Other organizations may deploy to geographically-distant environments. For example, their development environment may be located in Brisbane, Australia (it's a great place to live! ), while their production environment is hosted by data centers in the US and Europe. Packages are transferred at deployment time. If packages are large this can take quite a long time. Information has to be shipped back and forth between the Octopus Server and deployment targets during deployments. High latency in these communications can have a significant impact on deployment durations. These customers would like to promote the release at a time of their choosing, have packages automatically transferred efficiently to the appropriate data center, and then perform the deployment as quickly as possible. Our proposed solution will enable you to spread your entire deployment pipeline across multiple Spaces, allowing you to promote releases to other Spaces, and flow deployment results back again to be displayed on dashboards. Imagine if you could add a Space to your Lifecycle, just like you can add environments, and then promote a release to another Space. When you promote a release to another Space, Octopus could bundle up everything required to deploy that release into the environments in the other Space. We will also cater for scenarios where there is strict separation between your Spaces (think PCI DSS). That's why we're calling this feature Remote Release Promotions. We think there are three major concepts at play to make all of this come together: Spaces, Trusts, and Lifecycles. A Space is a concept we introduced in our previous RFC. Each Space has its own set of projects, environments, Lifecycles, teams, permissions, etc. We will talk more about configuring Spaces later on, but in the meantime we want to be clear: we will support Spaces that can communicate with each other, and Spaces which cannot communicate with each other. If you are happy for your Spaces to communicate, then we will aim to provide a super smooth experience. Promoting a release to a remote Space will be as simple as pushing a button (or hitting the API). Likewise you could have the deployment results flow back automatically so your dashboard is always up to date. We will also support isolated Spaces, as this is a common security scenario. Things will by necessity have to be more manual; you may have to do a little more typing (and maybe even some walking!). We already have the concept of establishing trust between Octopus Server and Tentacle: it will only execute commands sent from a trusted Octopus Server. We also think it's important that a trust relationship is established between two Spaces before they start sharing things like everything required to deploy a release and the results of deploying a release. We talked about sharing in our recent blog post introducing the concept of spaces and the Octopus Data Center Manager (ODCM). At its core this relationship will consist of a Name and a Certificate. This will enable each Space to uniquely identify the source of information, and validate the integrity of the information, just like Octopus Server and Tentacle do today. We think the best way to configure this relationship is using ODCM since its core capability is managing Spaces. This means you are in control of which information flows between different Spaces, and you can audit it all in one place. We think Lifecycles should be defined within a Space and able to be composed across multiple Spaces - you can think of it like chaining together Lifecycles from different Spaces. Define within a Space: This gives the teams in each Space the ability to manage their own environments and Lifecycles how they see fit. For example, a member of one Space might decide to introduce an environment into their Lifecycle. We don't want the decision to introduce an environment into a Lifecycle in one Space to have any impact on any other Spaces. You might want to promote a release through your test environments, then promote the release to a different Space to manage your production environment. You might do the same thing but host your production environment across different geographic locations. You might want to promote a release through your Dev team's test environments, then promote the release to another Space managed by a QA team. When they are finished testing you want the Dev team to promote that same release to yet another Space where the Operations team manages your production environments. You might want to do the same thing, but once the QA team is finished they promote the release directly to the Operations team's Space without going back through the Dev team. In the rest of this RFC we are going to introduce some new terms. Let's define them here so we don't all get horribly confused. 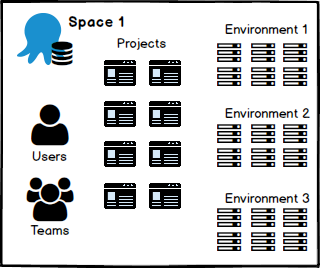 Space: Contains a set of projects, environments, variables, teams, permissions, etc, bounded by a single Octopus database. Learn more in our recent RFC. Release Bundle: A package containing everything required to deploy a specific release of a project. Deployment Receipt: A document containing everything required to show the result of deploying a specific release of a project. Source Space: The Space that owns the project and its releases, and where release bundles are created if you decide to cross Space boundaries. Target Space: The Space where a release bundle will be imported. The release can then be deployed to environments in this Space. Remote Environment: A reference to an environment owned by another Space. Remote Project: A reference to a project owned by another Space. Remote Space: A reference to a Space managed by a different ODCM, usually in a different network. The concept of a Remote Space will enable you to promote releases across secure network boundaries. 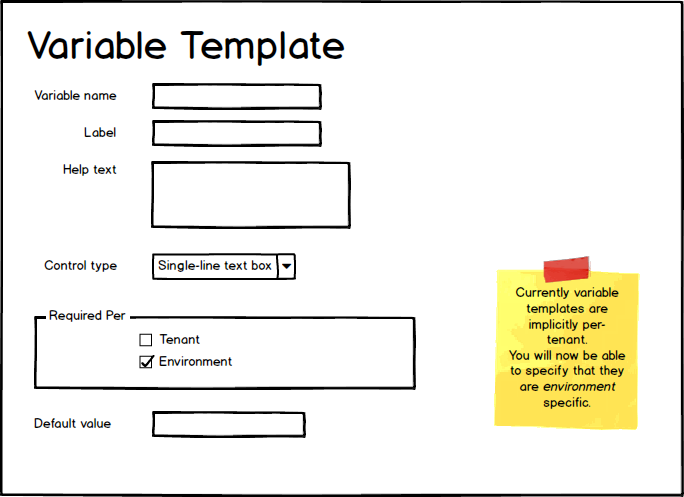 Variable Template: We introduced this concept with multi-tenant deployments. In this context you could express that a variable value is required for each environment a project can be deployed into. Let's consider how each different person in your organization might interact with Octopus to promote a release across these two Spaces all the way to production. TL;DR Use ODCM to configure relationships between Spaces. A good place to start is by configuring your Spaces and establishing a trust relationship between them. In cases like the Segrated Environments scenario, we think you will end up installing an instance of ODCM inside each network. This will allow your teams to independently manage the Spaces inside each network, and configure trusts between Spaces in the same network or across different networks as required. In the connected scenario, this would be be a single ODCM instance that would manage the spaces, with the certificate exchange happening automatically. Use ODCM in your development network to download the certificate for the DevTest Space. Go to the ODCM in your production network and create a new Remote Space called DevTest Space giving it the certificate you downloaded for the DevTest Space. Use ODCM in your production network and download the certificate for the Prod Space. Go to the ODCM in your development network, create a new Remote Space called Prod Space giving it the certificate you downloaded for the Prod Space. You will be in complete control of the trusts (and therefore the information flow) between Spaces. TL;DR Nothing much changes - everything will feel very familiar. How do you provide variable values that will be used when deploying to the Production environment? How do you configure special steps of your deployment process so they only execute when deploying to the Production environment? How do you show the result of deployments to the Production environment on your dashboards? Please welcome Variable Templates and Remote Environments! TL;DR We will extend variable templates to enable per-environment variable values. Imagine if you are the person importing a release bundle into your Space - you will need to know which variables need values for each environment in your Space. Now imagine as a project contributor if you could express that a variable value is required for each environment a project can be deployed into. And imagine you could define a data type for the variable, provide help text, decide whether the value is mandatory or optional, or even provide a default value. Variable templates will make it much easier for a person importing a release bundle into their Space to "fill in the blanks". This would also be really handy even if you are only promoting releases within your own Space. Using variable templates, if you introduce a new environment into your own Space, Octopus will prompt you for those variable values. 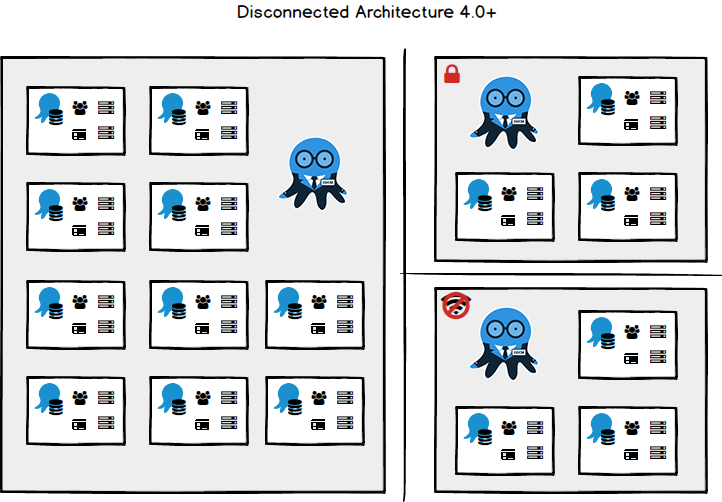 We introduced the concept of Variable Templates for multi-tenant deployments in Octopus 3.4. We will build on this concept further as part of this set of features. Note: This will also allow tenant variables to vary per environment (a much requested feature). TL;DR You will be able to scope deployment steps and variable values to environments owned by other Spaces, and display these environments on dashboards. The problem here is that the Production environment is owned by the Prod Space, so your DevTest Space doesn't know the Production environment exists! Imagine if you could add a Remote Environment to the DevTest Space. This remote environment would be a placeholder for the real Production environment. Octopus could even name it Prod Space: Production so we are all clear about the ownership of this environment. Think of this like namespaces: you can have a Production environment in multiple Spaces. you could scope steps to Prod Space: Production, and those steps will be run when a release is eventually deployed to that environment. you could set variable values in your DevTest Space, scope them to Prod Space: Production, and they will be used when a release is eventually deployed to that environment. TL;DR Other Spaces and Remote Environments can be added to Lifecycles. 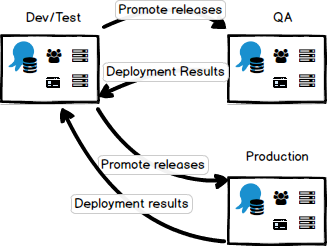 In order to promote a release to the Production environment, you will need to configure a Lifecycle with the ability to target the Prod Space. We think you should be able to add Spaces into the Phases of your Lifecycle just like you can add environments in Octopus today. This would work quite nicely for our example scenario where you just want the release promoted to the Prod Space. What if you wanted to create a more complex Lifecycle? For example, you promote releases to a QA Space for testing by the QA team, before promoting that release to the Prod Space. We think you should be able to add Remote Environments to your Lifecycles, making Octopus behave just like that environment was part of the same Space. TL;DR Remote Environments can be displayed on dashboards. By adding a Remote Environment to your Lifecycle, Octopus will add that environment to your dashboards. We are planning to allow the result of your deployments to flow back to the Source Space. This means you could see a summary of the deployments across your entire deployment pipeline even if it crosses multiple Space boundaries. Eventually you want to deploy a release to the Production environment! Since you have added the Prod Space to your Lifecycle, you can now promote your release to the Prod Space. At this point Octopus would create what we are calling a Release Bundle: a set of files including everything required to deploy that release to environments owned by other Spaces. In our example somebody would have to manually transfer the Release Bundle to the Prod Space and import it. If your Spaces are connected, Octopus could automate a lot of this process for you. TL;DR Contains everything required to deploy a release into the environments owned by another Space. Sensitive parts are encrypted, with the bundle signed to validate integrity and trust. We are still figuring out the details about release bundles, and would welcome your feedback. The Release Bundle will not include the packages themselves, but instead includes a manifest of the packages required by the release, including the ID, Version, and Hash. This will enable the packages to be transferred or replicated to the other Spaces in the most efficient manner possible (perhaps using delta compression), or enabling the use of an external package feed. This will also enable the Target Space to validate the identity and integrity of the packages being deployed - they are guaranteed to be the same ones that were tested. The Release Bundle will contain a summary of the completed deployments in previous Spaces, allowing them to be optionally displayed on the dashboard in the remote Space. When building the Release Bundle the Source Space will encrypt any sensitive information with the certificate of the Target Space so it can only be decrypted by the Target Space. It will also digitally sign the bundle with the private-key of the Source Space so the Target Space can validate the source and integrity of the bundle before importing it. The Release Bundle will have a schema version. Bundles can be transferred between Spaces with compatible schema versions. Our hope is that the Release Bundle schema version will change far less frequently than Octopus Server versions, allowing compatibility between a range of Octopus Server versions. TL;DR Imports the remote project, release, process and variable snapshot. On import, you will choose the Lifecycle for the release. You would be shown a list of Release Bundles ready to be imported and you choose to import one. 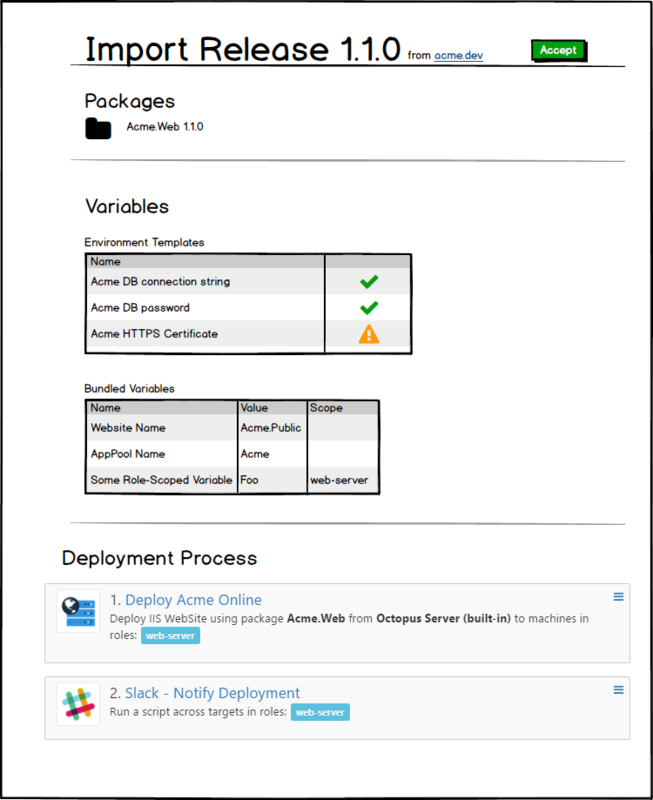 You would then be shown a display including the packages required for the release, bundled variable values, variable templates, and the deployment process. The project will be imported as a Remote Project. Similar to a Remote Environment your project would be namespaced like DevTest Space: My Project. We also think the Remote Project should be largely read-only, and will probably use a fairly different UI to normal projects. The release itself will be imported along with the deployment process snapshot and variable snapshot that were frozen when the release was created. You will need to choose the Lifecycle you want to use for promoting this release through the environments in the Prod Space. If your project only uses a single Lifecycle it could be chosen automatically. Octopus will prompt you to set any missing variable values for your environments and tenants before the release can be deployed. TL;DR Things owned by other Spaces will generally be read-only. For example, we expect you will want the deployment to use the process as it was when the release was created (repeatability) but have the chance to set the correct database connection string for your environments/tenants (variability). 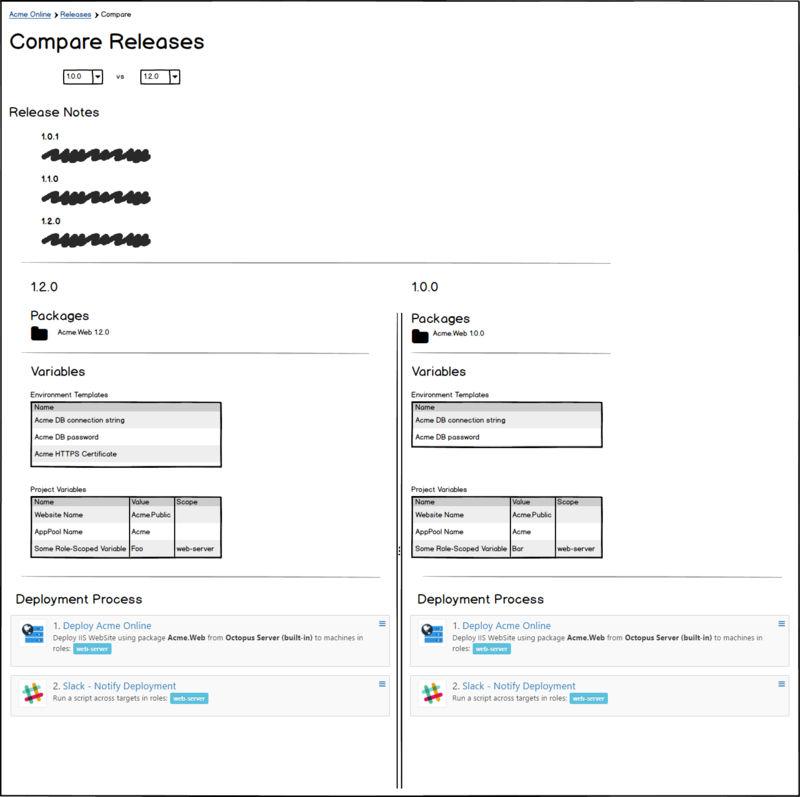 TL;DR We will add the ability to view the deployment process and project variables for specific releases, and view the differences between two releases. We think an important part of this feature will be the ability to view and understand the deployment process and project variables that were frozen into a snapshot when the release was created. Imagine trying to import and approve a release for deployment without being able to see the process and variable values that will be used during deployment? This is actually a problem we've wanted to solve for quite some time: in Octopus today, you can see the variable snapshot (if you can find the correct link) but you cannot see the deployment process as it was defined when the release was created. Imagine if you could even view releases side-by-side to compare them with each other! TL;DR You'll be able to deploy the release just like it was created in this Space. TL;DR Tenants are a deployment-time concern and will not cross over Space boundaries. Tenants will be owned by the Space where their deployments will be performed. Tenants in one Space cannot be connected to environments owned by another Space. We are definitely interested in hearing your thoughts here. Let us know in the comments below. If you have used either the migrator or octo.exe import/export to move releases between Octopus instances you know that there are benefits for both methods, but also that it still requires a fair amount of scripting or interaction to use either for your purposes. Both of these will be deprecated and replaced by Remote Release Promotions. Migrator export will still exist for those using the JSON files in source control to detect changes and backup processes. We are aware of customers who instead wrote their own migration scripts and process. We have tried to address all methods and concerns that these solutions contained in the remote releases feature; please let us know if you think anything is missing from this feature. Our goal is you would use Remote Release promotions and not have to maintain your own scripts. This feature will also replace Offline Drops. 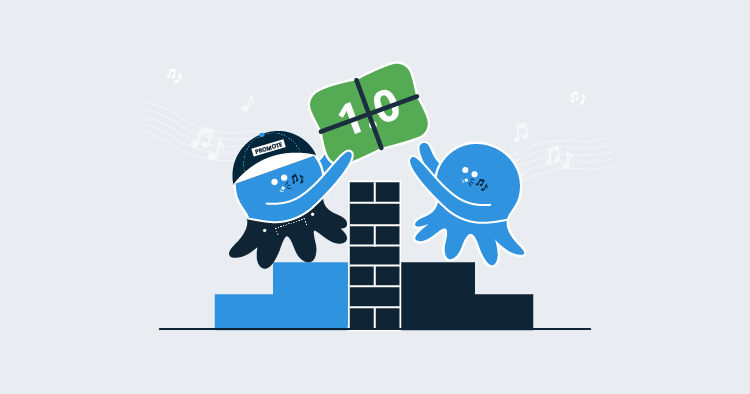 While it may not seem a direct correlation, and you will require an Octopus Server on the other side to catch the release bundle, many of the suggestions and limitations around Offline Drops are the missing pieces that are provided by Octopus Server. These include basic orchestration, output variables, logging, and deployment status to name a few. It will allow you to move the release to a centralized Octopus Server within the network boundary and make use of the extended orchestration by deploying to the local Tentacles. 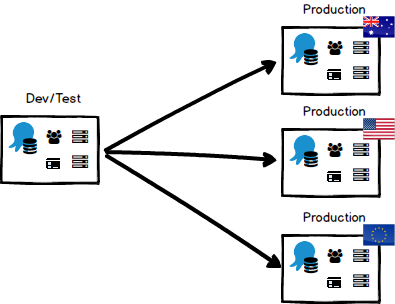 In a remote-promotions world you will be able to model lots of interesting scenarios using multiple Octopus servers with releases flowing between them, even if the Octopus servers are connected or disconnected. 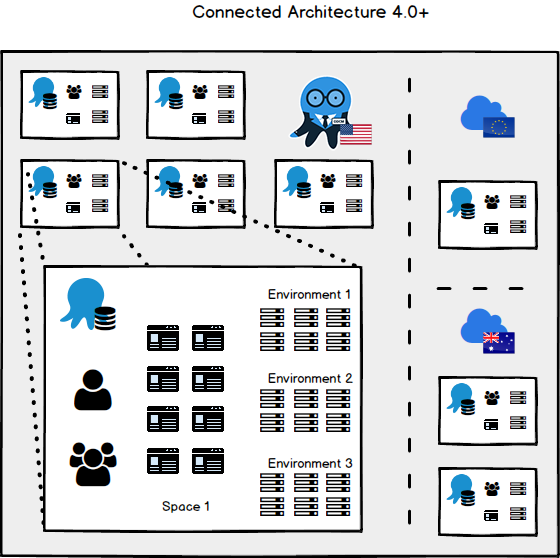 A connected architecture will account for multiple teams working in their own Spaces, then pushing releases to production Spaces that are hosted on-premises in the US, and in the public cloud in Australia and Europe. All of the Spaces are managed by the same ODCM which makes it easy to globally manage teams and trusts. Since all of the Spaces are connected you can achieve a high level of automation for your deployments, even across multiple Spaces. Disconnected networks have multiple teams working in their own Spaces, then pushing releases to production Spaces hosted in other data centers. The important difference here is that the Spaces in each data center are managed by their own ODCM. You can still have the exact same end result as the connected architecture, the only downside being you won't be able to achieve the same level of automation across the disconnected Spaces. Hopefully you can tell we have put a lot of thought into this set of features. We have tried to cover all of the scenarios and nuances we've encountered in our relationship with a variety of customers. There is a lot to digest here,so thanks for sticking with us to the end. You're ace. We would really like to hear from you! Which features resonate with you and will make your situation better? Perhaps there are some pieces of the puzzle we've missed for your scenario? Feel free to leave a comment below, or if you really want to get involved in the nitty gritty of the design, head over to our specs repository to join in the conversation!